First Aid Day is an opportunity for Webelos Scout and Scouts in troops to learn first aid skills. During the morning, Webelos will work on the First Responder Adventure and Scouts in troops will work on the First Aid Merit Badge. After lunch is the First Aid Meet. Scout patrols are tested on their first aid skills. Patrols work as a team to solve several first aid scenarios. Scouts in troops can participate all day or just participate First Aid Merit Badge class or the First Aid Meet. Webelos Scouts and Scouts in troops can register individually for the merit badge day workshops. Unit leaders should sign up patrols for the First Aid Meet. The cost is $7.50 for the first Scout and $6 for each additional Scout. Space is limited. Registration is completed online with credit card, electronic check or PayPal. Council refund policy. Late registration begins 1/25/18 and is $16.50 for the first Scout and $15 for each additional Scout. Webelos Scouts: • Field uniform (Scout uniform) or activity uniform (any Scouting t-shirt), • BSA Annual Health and Medical Record (Part A & B for any Scouting event). First Responder is one of the Webelos CORE adventure requirements. This adventure will provide Webelos Scouts with an introduction to the skills and responsibilities of a first responder. 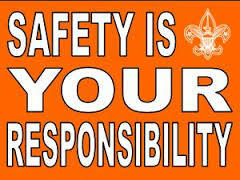 Activities will cover essential personal safety and first-aid skills. Learn more about the First Responder Adventure. 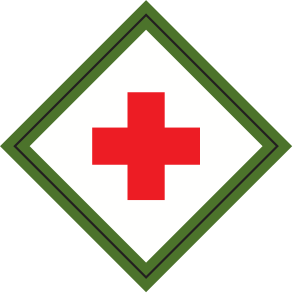 The First Aid Merit Badge Class is an advancement opportunity open to any registered Scout in a troop, crew or ship. Scouts are expected to participate fully in order to receive full credit for the advancements covered during the class. All Scouts are required to bring a blue card signed by their Scoutmaster. Scouts will not be able to complete all of the entire requirements in just three hours of class. The blue card will be signed for only the items that will be covered in the class. Scout will need to complete the rest of the requirements with a merit badge counselor in their troop. 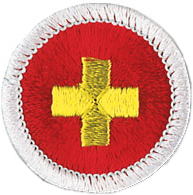 Scouts are not required to participate in both the Merit Badge class and First Aid Meet. Scouts may attend one, or the other, or both. We encourage all Scouts participating in the First Aid Meet to take the First Aid Meet Workshop to practice for the meet – practice makes perfect! Every patrol will be presented a problem and will have a set amount of time to solve the problem. At each problem, there will be four performers and one victim (any other patrol member must “sit out.”) Each member must serve as a victim in at least one problem situation. No books or pamphlets are allowed. Teams: Teams should be from regular existing (natural) patrols. Each team should be composed of a minimum of five members. Judging: The judging standard will be the current Scout Handbook and the First Aid Merit Badge pamphlet. Each patrol shall provide an adult to serve as a judge.
. Only those patrol members who participated in the district meet with their winning patrol can participate as patrol members at the council council First Aid Meet Awards will be given to the top three teams. The top three scoring patrols represent the district at the Awards:meet. No substitutions to the patrols are allowed at the council event. Equipment: Each patrol should provide all equipment needed to demonstrate proficiency in First Aid problems, including a rescue breathing apparatus; poles, blankets, and other material for making an improvised stretcher; one sleeping bag; a troop/patrol size first aid kit; and patrol flag.